Team Ireland Olympic sports continue to gain a performance advantage by familiarizing themselves with the environment they will experience at the Olympics next year by in the Rio Test Events. Following on from recent involvement by Horse Sport Ireland performance staff and Triathlon Ireland athletes and performance staff, Irish Sailing are next up in the Aquece Rio Intl Regatta (Rio 2016 test event) – 12-22 August 2015. Aquece Rio is the test event programme for the Rio 2016 Olympic and Paralympic Games. In total there are 45 sporting contests, which will primarily take place in the same venues as the Games themselves, aiming to test all operations involving competitions. The events will be staged in four competition zones – Barra, Copacabana, Deodoro and Maracanã. 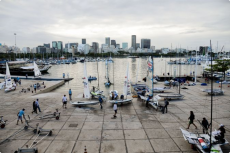 The first event, the Aquece Rio International Sailing Regatta, took place in Guanabara Bay in August 2014, and the last is scheduled for May 2016, three months prior to the Games. The Rio 2016 Committee will be involved in all test events, and will have the opportunity to test specific operations in 15 competitions organised by national or international sport federations, focusing on the competition area, including the Games results system. In total, the Rio 2016 Committee will organise 25 events, where many others aspects will also be tested, such as security, cleaning, transport, etc. In addition, five more sporting events that will have a shared command between the Rio 2016 Committee and sport federations intend to simulate the Rio 2016 Olympic and Paralympic Games. The test events are also a chance for the athletes to get to know and familiarise themselves with the competition venues and, in some cases, they are an opportunity for the public to participate and engage with the event. In total, 7,000 athletes will gather for the test events – many of them coming to the city for the first time – as well as 12,000 volunteers. The programme will have three “waves” of competition. The first will be held from July to October 2015, with a focus on outdoor sports, such as triathlon, rowing and equestrian. The idea is to provide athletes with the same climatic conditions they will find at Games time. The next wave will take place from November 2015 to February 2016 and will be more focused on indoor events. The last wave will be from March to May 2016 and allow for Games preparations to be finalised.